Texas oil companies have donated nearly $6 million to pass Prop 23, which would repeal our stateÂ’s anti-pollution laws and destroy our green jobs economy. 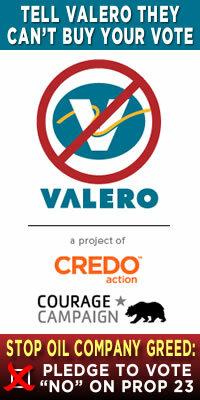 One of those companies, Valero, just kicked in another $3 million to the initiative campaign last week. We've stopped wealthy corporations from buying California elections before. PG&E spent $45 million to pass Prop 16, but we helped educate and organize voters about the initiative and we defeated it in June. We can do it again this November. We, the undersigned, pledge to oppose and help to defeat Prop 23 on the November ballot in California. We refuse to let Texas oil companies buy our elections so they can continue polluting our environment and destroy our green jobs economy by repealing our state's global warming law. We pledge to match every contribution the oil companies make to Prop 23 with our own effort to organize and educate voters to stop it. We pledge to stop Valero and their oil company allies and protect progressive economic and climate policy in California.